Wanting to explore the darkened landscape and valley below me, I decided to venture off into the unknown at dusk. Packing only what I thought was necessary, I slowly crept out into the inviting surroundings. I would drink in everything I could – from the sound of the creaking twigs screaming beneath my feet to the screeching sounds of the birds hidden from my view. As I climbed through entangled branches and across moss laden rocks, I felt myself lose my footing. Tumbling, my once strong and graceful leg broke neatly in two. My ankle was lovingly, firmly held by the forceful grasp of needy roots - ensnared – intertwined. Certain I would meet my demise, I began shaking and trembling, my entire body erupting in a fit of madness. I would hear the sounds of curious creatures sauntering – surveying the now easy prey trapped before them – a sacrificial lamb waiting to be devoured. They would cackle with pride and giggle with gluttonous glee. Alone, I awaited my horrible, undeniable conclusion. The forest, in all its cordial and enticing beauty – my open casket. Catacomb of catastrophe. 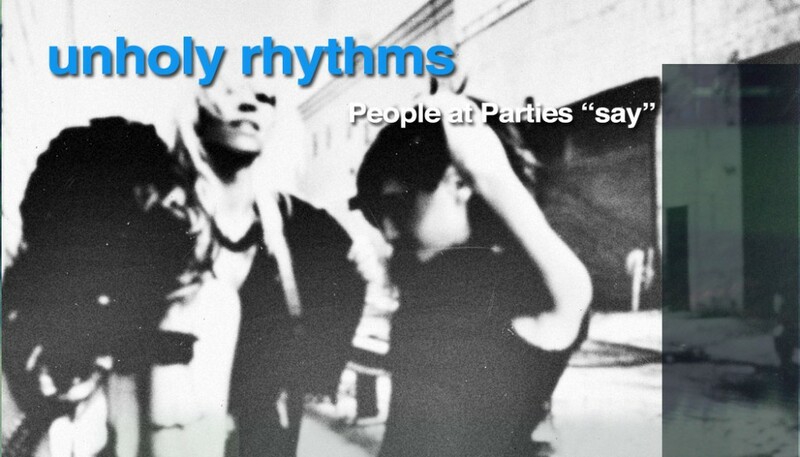 People at Parties - dulcet, dark pop for the doom generation – gothic pop soul for those disciples draped all in black. Pulsating, pounding synths that rightfully nod to the sounds of yesteryear while remaining fresh and tenebrous – foggy effervescence. Synths creep and stroll alongside demanding, dusky vocals. “Say” is summertime anthem darkly cloaked in defiance. And in spite of the circumstances, you are ready and willing to risk it all.